Schrock Innovations‘ PC Maintenance Checkup Sale is by far one of the most popular times of the year to bring a computer into their computer repair Service Centers. 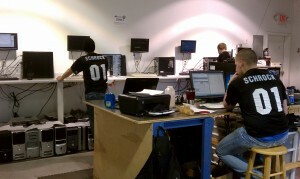 Over the past week Schrock’s technicians have been pulling overtime to keep up with demand. 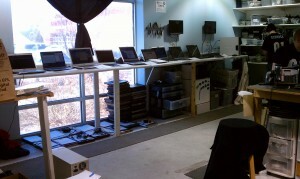 As you can see, as soon as Schrock launched the sale computers started pouring in to the Service Centers. By the end of the first day more than 100 computers had arrived for the $30 maintenance offer. Throughout the course of the sale Schrock took in over 1,000 systems for maintenance between Omaha and Lincoln, NE. The load was unusually weighted toward desktop computers over laptops. Over the past couple years Schrock has seen a steady shift away from desktop computers toward notebooks. The company has also been advertising on FM radio stations for the past 9 months which tends to bring in a younger demographic who prefer the portability of a notebook over a desktop. Either way, it was a little surprising to see the desktop hanging in there in the quantity department. Schrock’s customers often hear that the Maintenance Checkup Sale is going on for “one week only,” but in reality Schrock’s technicians have been working under a load of 100+ computers in queue for more than 3 weeks. When Schrock launches a sale this big, it is always a challenge to keep turn-around times reasonable the customer. To help moderate the work flow, Schrock will email existing customers about the sale first, then work through the bulk of that response before taking it live on the radio. 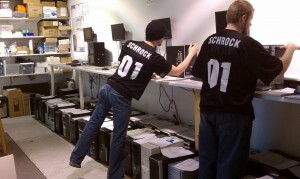 Schrock emailed over 8,500 customers about the sale and the response was immediate and intense. While a flood of Schrock’s existing customers was expected, we were shocked to see that about 20% of the computers coming in after the email were new customers. Apparently the sale announcement email went viral with customers forwarding it to their friends and relatives. All in all, Schrock’s technicians have been putting in 60-70 hours a week EACH in an attempt to keep up with the demand. With the sale ending today at 5 PM they should have everything back to normal again in each Service Center within a few days. Thank you Schrock customers for another amazingly productive Maintenance Checkup Sale!